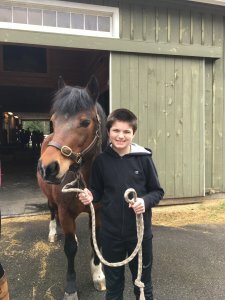 Barn Buddies is a dynamic 12 week off-the-horse program where children, in a motivating and supportive environment, learn about horses and horse care. Challenging and fun, Barn Buddies places students in integrated small groups comprised of children with and without special needs ages 5 and up. Guided by a licensed Riding Instructor and enthusiastic volunteers, children work as a team to take care of Lovelane’s wonderful horses. Through exciting games, activities and barn chores, Barn Buddies promotes the physical, emotional, and social growth of each child.